Changing the conversation: A bad idea? Advocacy & Safety Cyclists should expect and demand safe accommodation on every public road, just as do all other users. Discuss your bicycle advocacy and safety concerns here. I’m worried that the urgent calls to action we’ve adopted as an advocacy tactic may be undermining our strategy. What if the “Interested but Concerned” cyclists who are always being courted might be scared away by repeated messages about life safety risks?" Is the paper about cyclists being too scared to ride because people are calling what used to be "accidents," "crashes" now? I haven't heard any one say that. Further, the number of fatalities is related to the new language, How? Is the author suggesting that there are more crashes because people are calling them crashes? That drivers are driving worse because of Vision Zero? Also, without knowing the actual Number of fatalities, it is hard to know if "almost double" is significant. if two people died one year and three the next, it sounds terrible as a percentage increase, but it is still just three car-bike collisions in a year. if the number went from 200 to 300, that would be and equal percentage increase but obviously indicative of some other very large change. The author admits in fact that the data might in no way indicate which she insinuates it might. "Eight of the nine cities gained cyclists between 2011 and 2014; aggregated cycling mode share rose by over 20% during that period. 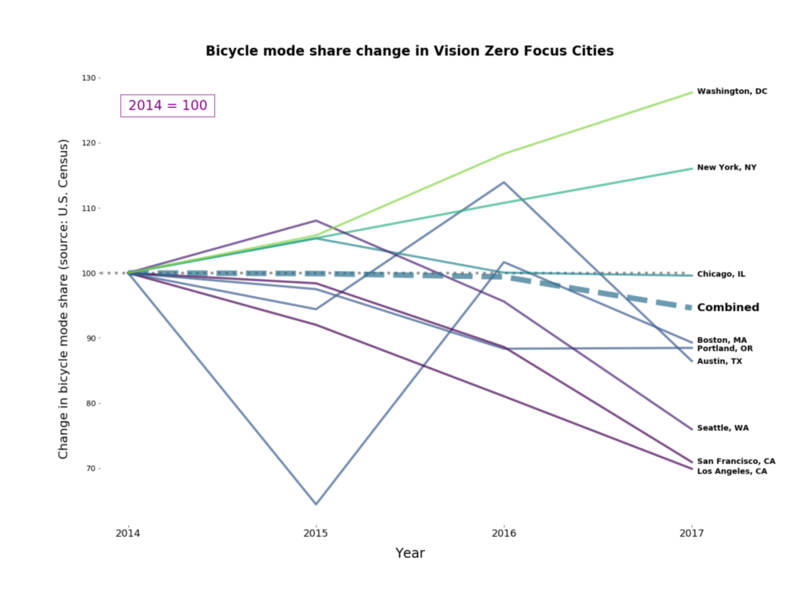 So, cycling had been growing, went into decline around the time these cities adopted Vision Zero, and went into further decline after they were named Vision Zero Focus Cities in 2016. And the 2018 data, which will include the impact of e-scooters, will look even worse. "Correlation is not causation, but this negative correlation with one of the core output metrics is exactly the opposite of what you’d hope or expect to see from a major advocacy program. That’s concerning." Exactly. Correlation is Not causation. There could be a hundred other factors influencing the amount of people riding bikes. There is Zero evidence that the language used by Vision Zero has Any effect, positive or negative. Making that assumption is just as likely to make things worse as better. She talks about "one of the core output metrics is exactly the opposite of what you’d hope or expect to see from a major advocacy program." But without knowing Why the "output metric" (some people love to use jargon--I guess they think it makes them sound more knowledgeable) has changed, the result itself is Not concerning---the Cause needs to be investigated. Maybe a lot of people started riding and then found that the streets were crowded. Maybe long-time cyclists stopped riding because of all the clueless salmon clogging the bike lanes. Maybe a lot of people tried it and decided they didn't like it. maybe the weather was hotter, or rainier, or both. Most likely there is an array off factors. The single greatest contributor is probably the proliferation of cell phones and the increase in texting. Let's see the increase in minutes of time spent texting or streaming during those same periods in those same time frames. There is Zero reason to think any bike riders were scared off by Vision Zero. Just as there is Zero reason to think that traffic fatalities increased because of Vision Zero. This is a bunch of BS. I am not an advocate of any part of "Vision Zero." I know nothing about it ... this is the first time I had heard any details about it. There are a couple posters were (not necessarily affiliated with or influenced by Vision Zero) who insist that car-bike collisions not be called "accidents," and I can see that point---while it was likely not intentional---the vehicle operator is presumed to be and mandated by law to be in control of the vehicle, and if one vehicle hits another, brushing it off as an "accident" is sort of like calling a fatal shooting in the course of a hold-up an "accident." If a driver runs into a cyclist, that is an Active, not a Passive occurrence. it didn't just "happen,' like an "accident." Someone messed up. Whether that change of language makes any difference in people's driving habits .... yeah, doubt it. Otherwise ... everyone seems to be reporting a rise in Distracted driving. I'd wager that cell phone use correlates a lot more closely with traffic accidents than any other metric right now. But ... like everything this author wrote, that idea is a pure assumption unsupported by actual relevant data. I personally would like to see some draconian laws for illegal cell phone usage. I live in rural area and had to put on a very expensive battery powered taillight so cellphoneites wouldn't run me down during daylight hours. I looked at the picture of the area where they say the cyclist was killed. That bike lane placing bicyclists between parked cars and traffic is a waste of paint. Maybe Sharrows or put the paint/ bike lane between the curb and the parked cars. Last edited by Rick; 04-16-19 at 12:01 PM. I have no idea how accurate the bike commuting share estimates are, or can possibly be. As far as I know, I've never been counted in any bike commuting statistic. In the past, I might bike commute, say 50% of the time, but even that might be hard to estimate. How many bike commuters are part-time bike commuters? And, the bike commuter share bounces around like a pinball with the economy and fuel prices. I live in rural area and had to put on a very expensive battery powered taillight so cellphoneites wouldn't run me down. Cycling safe is prudent, no matter what other road users are doing. Use good lights, and use a good helmet, and use a bit of common sense to be safe. With fuel prices stable, and the economy going strong, the bike commuting share is naturally dropping in many places. Accidents increasing? Well, again, that also bounces around with the number of cyclist and vehicle miles. ... or put the paint/ bike lane between the curb and the parked cars. Which just increases the number of collisions in intersections, which is already the area cyclist need to pay the most attention to avoid collisions. Last edited by CB HI; 04-16-19 at 02:36 AM. I personally would like to see some draconian laws for illegal cell phone usage. Sadly, the cell phone industry lobby is too powerful to ever get meaningful legislation passed. I don't believe this to be true. Properly built bike lanes, have an area with broken lines indicating that traffic can enter or exit before the intersection. When they can't or wont do this Sharrows as a reminder can be placed. I am not a bike lane proponent. Meaning poorly designed bicycle infrastructure is worse than no bicycle infrastructure. If someone does not know how to ride there bicycle to get where they are going at intersections, that is a problem that can and should be solved by education. +1 Portland does this on the main drag, Broadway, as it passes PSU. I now know I am riding where no one is looking for me, cars cars or pedestrians. It never occurs to pedestrians who do not have previous experience here that the void between the parked cars and the curb has traffic. Likewise, cars on crossings aren't looking either. And the usual defense of just moving further to the left to be seen and noticed is now impossible. Regarding rider education - I have not come across a source for information on what street changes Portland and the surrounding towns have done. Have had a few near crashes as I navigated new obstacles on roads I have been riding for years. (One 100' from the office building door of the job that brought me to Portland 22 years ago, The road does a quick "S" turn onto a bridge. You cannot see the turn as you approach from the south. Just as you start the second portion of the turn, to the left, you have to duck right to get around the new traffic separator. My first time, whew!) I guess I am the one at fault, I should be taking on the task of educating myself to what all the local communities are doing to increase my risk of crashes in the name of "safety". Only ride roads I both know and have ridden recently unless I have fully researched them. Bikes: Surly LHT, a folding bike, and a beater. There is talk around my town of moving bike lanes between parked cars and the curb. This will just about kill my desire to ride a bike in the city, or find routes WITHOUT bike lanes. The only thing that keeps our streets from filling up with tree branches and debris are the cars rolling over that stuff and crushing it to dust. How and Who will clean between the cars and the curbs on heavily turtle-backed streets? On rainy days I'll be cycling in a whitewater river. Or at least a creek. The problem with bike lanes on the sidewalk side of parked vehicles is that drivers cannot see the cyclists. No matter how careful the cyclist might be, his/her chances go Way down if none of the drivers know s/he is there. What bike lanes inside lines of parked cars would create is a situation where cyclists were suddenly and unexpectedly popping up from behind an obstacle. EDIT__Whoops, i see that quite a few riders have already replied. Yes only going half way with the infrastructure always makes it dangerous. You would need a curb between the cars and bicycles up to the intersection. You would also need different controls at the intersection. You would also need everybody to cooperate with each other. As much as possible I avoid down town areas were there are poorly designed pedal here things in the road. Weather they be lines, green paint or little signs saying pedal her. I prefer a wider curb lane and slower speed limits. There is a fundamental tension here that needs to be considered. The best strategy, as I see it, for promoting the building of better and more extensive and appropriate infrastructure is to get as many people as possible riding--then they and their families have a vested interest in pursuing the changes. I know a fair amount of people who tell me they won't ride because they feel unsafe, so an advocacy strategy that emphasizes fatalities and danger may be utterly counter-productive in that regard. On the other hand, what the advocates seem to be doing is an attempt to scare drivers into altering their behavior. Arguably, this is a strategy that worked well with drunk driving, and that seems to be the model the advocates are using. The problem with this as a model is that the fear they're trying to inculcate also is communicated to potential cyclists. There really wasn't such a group to worry about with drunk driving. I understand that the data don't prove that Vision Zero is causing a decline in ridership or a decrease in safety, but the absence of any good trend in either of those figures while Vision Zero has been operating is actually evidence that the campaign is not having any strong good effect. More butts on bikes does not make cycling safer. Back in the 1970s and 1980s with few cyclist around, motorist left me alone regardless of my road position. Now that 'more butts on bikes' has made it a competition for asphalt space, too many motorist have become hostile against cyclist. It appears when everybody pushes for infrastructure tensions rise. It also appear that there is a lack of consistency in what is built. For motorists that don't bicycle there is confusion as to what some of these changes mean. There is a lack of standardization and osmosis does not work in place of education. There is plenty of information on how to ride safely and be seen. It just has nothing to do with bicycle infrastructure in The US. It is possible to build bicycle infrastructure that is safe but it would inconvenience motorists. This is what I think the author is focusing on - the aggressive language used to scare drivers may also be scaring potential cyclists. "Bicycle crashes are so rare that it’s hard to study them." People riding bikes in a single city in the United States are so rare that it is nearly impossible to study them. And this blog entry is the classic example of seeing what you want to see. The graphs of commuter mode share over time and non-motorist fatalities over time in a single city is noise, all noise, and nothing but noise! Look at the Boston line. What did we do horribly wrong in 2014/2015 that caused a 40% PLUMMET in mode share? The *CORRECT* answer is that the mode share did in fact NOT plummet in 2014/2015. Noise is noisy. I thought 2015 was the year Godzilla attacked the Harvard Crew Team, causing widespread panic and I forgot to wear my pants to school. Sorry, that was a dream I had last night, never mind. Right, they were using the MADD model to promote bike safety, but scaring people out of drunk driving doesn't have the side effect of scaring people out of behaviour we're seeking to encourage. You've conflated two ideas here - fatality trends in a single city and mode share in a single city. "Four consecutive blizzards in the winter of 2015 brought the city’s transportation systems to a halt due to a combination of heavy snow and extreme cold. When the T had to be shut down, driving became necessary for many, yet it was extremely dangerous for days. Pedestrians were forced to walk in the street for weeks to avoid ice and snow on sidewalks, and many bicyclists had to use vehicle travel lanes." Bicycle and pedestrian fatalities in Boston are SINGLE DIGITS each year. There is no trend, there's too much noise. Bicycle commuters 1-year ACS are several thousand per year, plus or minus about a thousand. There is no year-to-year trend, there's too much noise. We can, however, say that there are more people on bicycles long term, but it would be far better to use less noisy data like 5-year ACS. Regarding Boston, I suspect the severe weather that year had an impact. Just so you know, we are a hearty people, but we are not Minnesota. The number of people commuting on bikes in the winter drops significantly every single year. Yes, February 2015 was bad. But not enough to cause a 40% drop in people commuting by bike in a single year. Last edited by mr_bill; 04-17-19 at 03:57 PM. I agree with @mr_bill. With such a small data pool, Any variation looks huge .... but really all variations are meaningless. The difference between one and two is One hundred percent !!!!! but one is as random as two as ten. Oh look .... in 2018 Boston has a Two Hundred Percent Reduction in fatalities. Whatever was done that year really worked, right? As for commuting ... 2017 levels are on par with 2014, but nearly twice 2011 .... so Zero Vision caused .... ??? Vision Zero has been statistically Impact-Free, is the right answer. But someone trying to sell or promote programs cannot admit that the program is having no effect---think of the questions That might raise. How many consultants would go out of business if people really examined whether their "ideas" had any impact on "output metrics"? So is the article suggesting a change in strategy during the US War of Independance, the US Civil War, Civil Rights Movement, the Suffragette Movement and the LGBTQ Rights movement were applied, there wouldn't be so much hostility today? As history tells us, nobody earns his rights simply by nicely asking for them. But wouldn't it be nice if it could? p.s. NEVER EVER normalize a series of noisy numbers with one of the noisy numbers. I mean, this is face palm stuff.